It’s rare that anyone looks around their kitchen, throws up their hands, and says, “There’s just too much storage space!” If you are like most people, there’s never too much cupboard space. Fortunately, finding enough storage space can be as simple as carefully organizing where you put things along with some strategic editing. Do you tend to collect empty deli or grocery store containers for future use? This is a habit that quickly gets out of hand, leading to orphan lids and unstable towers of containers that threaten to spill out every time you open the cupboard door. Invest in a set of more durable containers with attached lids. They’re stackable, you can put them in the freezer or the fridge, and you’ll never have to toss those poor orphan lids again. Aside from a toaster and a coffeemaker, avoid buying one-use gadgets as much as possible. Late-night informercials do a great job of convincing you that you must have whatever wonderful kitchen time-saving device that they’re offering, but mostly these things just sit in your cupboards taking up space. When you buy appliances, decide if you absolutely need each one or if you can get away with using an appliance you already have to do the same job. You’ll save lots of space by not crowding it with one-use gadgets you pull out once or twice in a lifetime. Plates, cups, and eating utensils should be easy to access. Cupboards that are near a sink or dishwasher are the best option to save time. Put your most-used dinnerware in the most accessible place, and let your good China hide away on top shelves, in another room, or on display away from your immediate kitchen workspace. 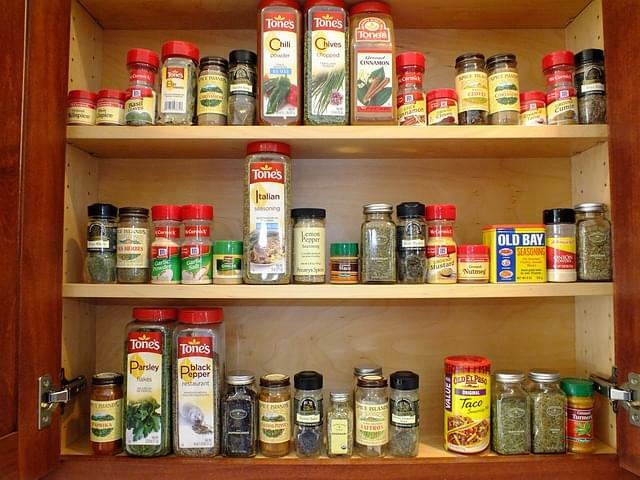 If you bake, dedicate a cupboard to common baking ingredients, and keep spices close to where you need them (usually the stove). If you find that your kitchen work routine has changed or you have accidentally stored things inconveniently, take the time to make the switch as quickly as possible. If things are conveniently located, you’ll spend more time cooking and less time gathering your ingredients, which means you’ll probably appreciate your kitchen more and spend less on take-out. That’s good for your budget and your waistline! Many people like to keep cleaning chemicals and soap under the kitchen sink, away from food and dishes. Wherever you have space to store cleaning materials, make sure it is not close enough to contaminate food but still close enough to making cleaning up simple and quick. If you still don’t have enough cupboard space after organizing your kitchen cupboards and your budget doesn’t allow for a kitchen remodel, continue to edit your belongings and tools, but you can also get creative with additional shelving. When you simply have too much to store in your kitchen or home, renting a self-storage unit is a great idea. Value Store It offers a wide range of clean, budget-friendly units where you can safely store kitchen and personal items without worrying about having them underfoot. Visit our Home page to get started.